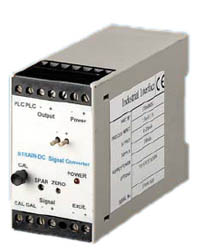 Virtually any type of input can be handled by the range of isolating signal converters by Industrial Interface. All feature 3 port isolation and provide isolated high level current or voltage output signals. 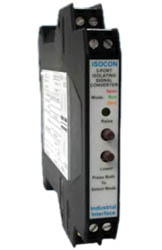 ISOCON - This Isolating Signal Converter can accept a wide range of inputs including 4-20mA, thermocouple, RTD and voltage signals. The units produce a high level DC output of either voltage or current. Full 3 port isolation is standard as is an isolated transmitter supply which can be used to power any standard 2-wire 4-20mA transmitter. The input type and range can be user selected using simple DIL switches inside the unit. All RTD and Thermocouple inputs can be fully linearised. Non-interactive zero and span controls make adjustment of the unit quick and simple. Other features include optional inversion of the input signal, an optional second analogue output (see Dualcon data sheet) and an optional Relay alarm output. The unit is supplied with two power supply options, either wide ranging ac or dc. The ac version operates from any supply from 90 to 264 Vac and the dc version operates from 12 to 36 Vdc. 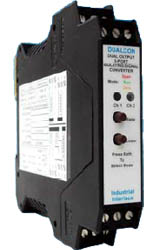 DUALCON - Identical in functionality to the 3-Port Signal Conditioner above, except that it has 2 independent and isolated outputs which can be configured separately. 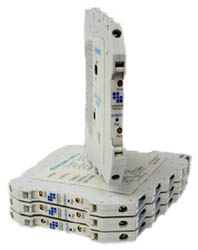 SLIM-CON This slim unit can accept a range of inputs including 4-20mA and voltage signals. The unit produces an isolated high level DC output of either voltage or current. This Isolated Signal Converter is very thin at only 7.2mm wide and is highly accurate with a fast time response. TC-TC This isolator accepts a mV signal from virtually any type of thermocouple and provides an identical isolated mV signal. This helps prevent earth loop and sensor failure problems in multi-thermocouple installations. The unit can be supplied in DC or AC powered configurations. STRAIN This unit is a Universal Strain Gauge transmitter. It will interface to the majority of strain gauges, load cells and pressure transducers. The unit provides a high stability excitation voltage which is isolated from both the high level output and the power supply. Front panel mounted trim pots allow adjustment of zero and span settings and output monitoring terminals allow the output to be measured without breaking the instrument loop. The STRAIN can be supplied in either AC or DC powered versions. Input/Output Modules providing High Speed & Accurate way of routing analogue and digital signals (mA,mV,V,Contact, RS232 & RS485) through Ethernet networks and onto the internet. Wireless pressure, temperature, level and humidity sensors and systems based primarily on the Zigbee protocol and IEEE802.15.4 (wireless hardware standard). Our Power supplies normally convert ac Voltage (85- 264Vac) to a stabilised and regulated dc Voltage (24Vdc). They are available with a range of power capabilities (10W, 15W, 24W, 30W and 240W).